Pantry staple dinners can be such a godsend. As much we all want dinners abounding with beautiful fresh veggies, sometimes you just need to be able to throw things together. Of course, it still needs to taste good. Better yet if you can get it all done in one pot, which is admittedly not my strong suit. This dish, however, checks all the boxes. My one gripe with canned beans is that they can be pretty bland tasting, so for this dish I wanted to used ingredients that would add bright flavors--wine, lemon, and mustard. 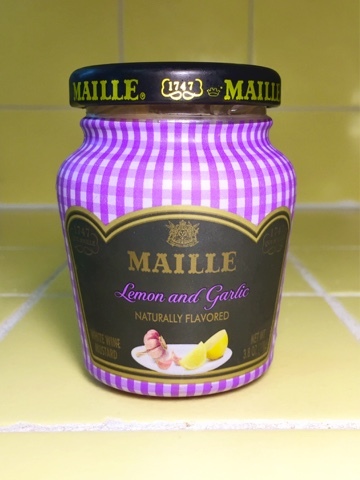 In this case, I used this Maille Lemon and Garlic Dijon to help intensify those flavors--but of course, you can substitute any Dijon you’d like. 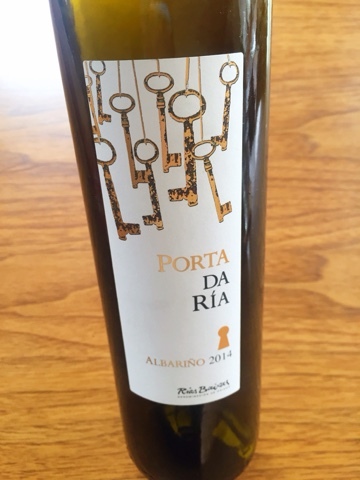 We paired this dish with this simple, reasonably priced Albariño for an inexpensive weeknight meal, but I can also see a wide variety of Italian whites working here. 2. Heat oil in a large pan. Season chicken with salt and pepper, then sear in the pan over medium-high heat until golden brown (4-5 minutes per side). Remove chicken from pan and set aside. 4. Add the onions and sweat until nearly translucent. (If onions are starting to brown, add a little water to slow down the cooking.) Add the garlic and lemon juice and continue cooking until onions are soft. 5. Add the cannellini beans and 2 tsp of the mustard and stir to incorporate. Stir in the sun dried tomatoes. Add chicken stock and season with salt and pepper. 6. 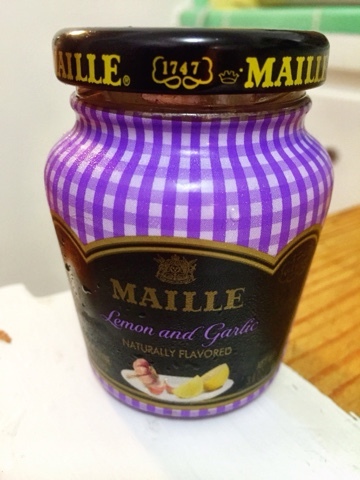 Combine the remaining 2 tsp of mustard with the ½ teaspoon of mayo. Brush onto the skin side of the chicken. Season again with salt and pepper if desired. Return the chicken thighs and any juices to the pan, skin side up. 7. Transfer the pan to the oven. 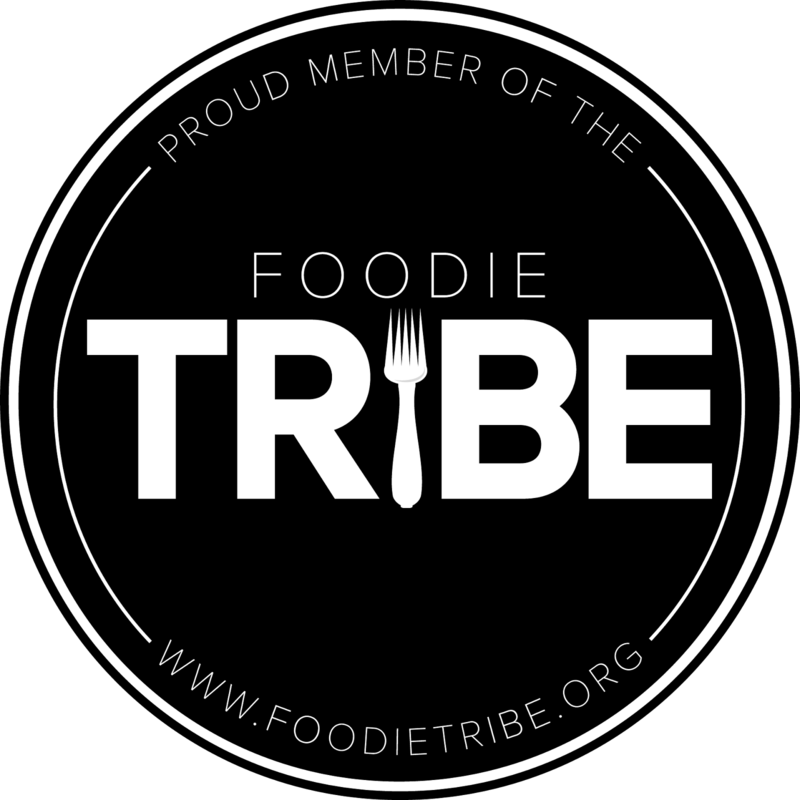 Continue cooking to allow the flavors to combine and until an internal read thermometer inserted into the thickest part of the chicken reads at least 165°F. 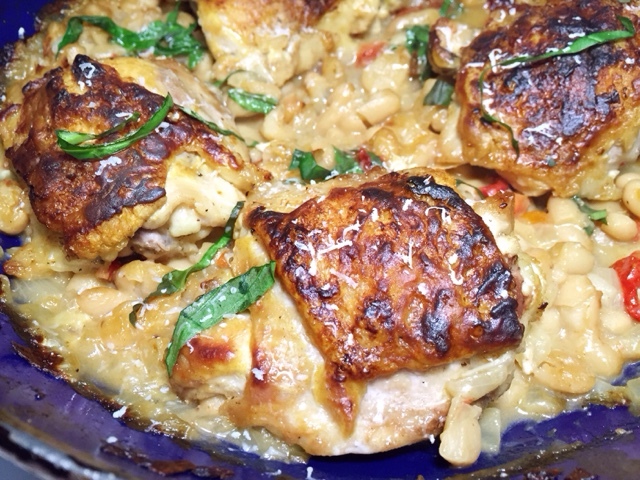 (Smaller chicken thighs were ready in 15-20 minutes, but if you have pieces of varying sizes, smaller pieces will not overcook if you leave them in with larger pieces.) Halfway through, stir the beans. If they’re beginning to look dry, add a small amount of liquid, being careful not to splash the chicken. 9. Remove the pan from the oven. Top with basil and Parmesan cheese and serve.